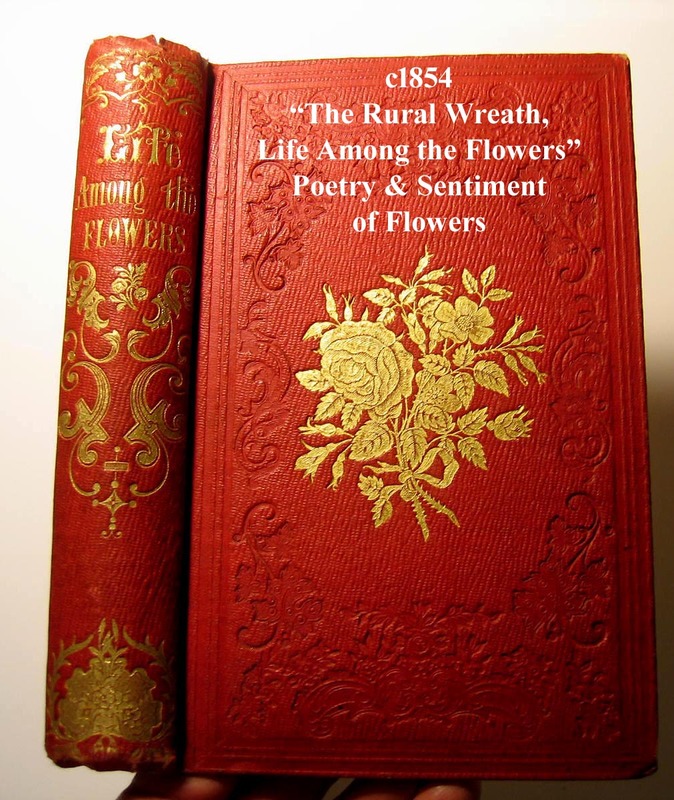 The Rural Wreath Life Among the Flowers Antique Book. 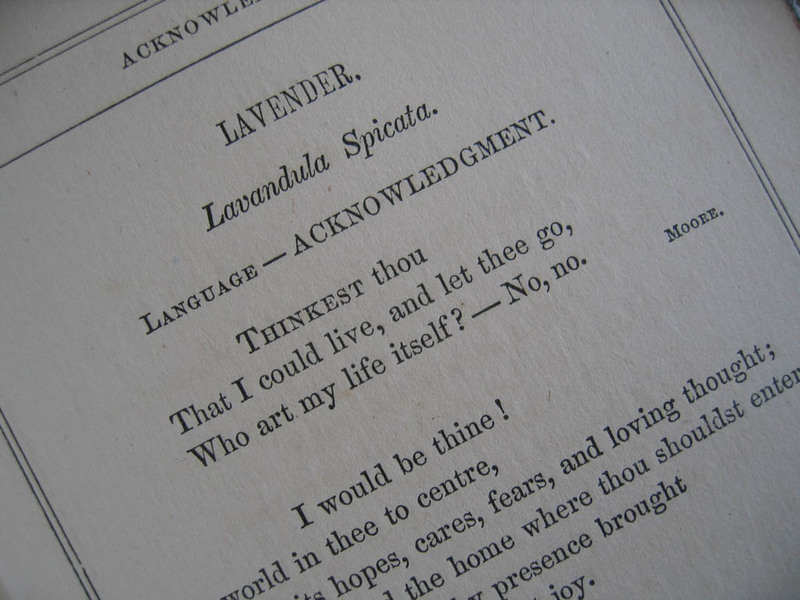 This sweet book by Laura Greenwood, published in 1854 (pre Civil War), entitled The Rural Wreath and Life Among the Flowers extols the poetry, language, virtues, sentiments, and symbolism of flowers, and is 158 years old. 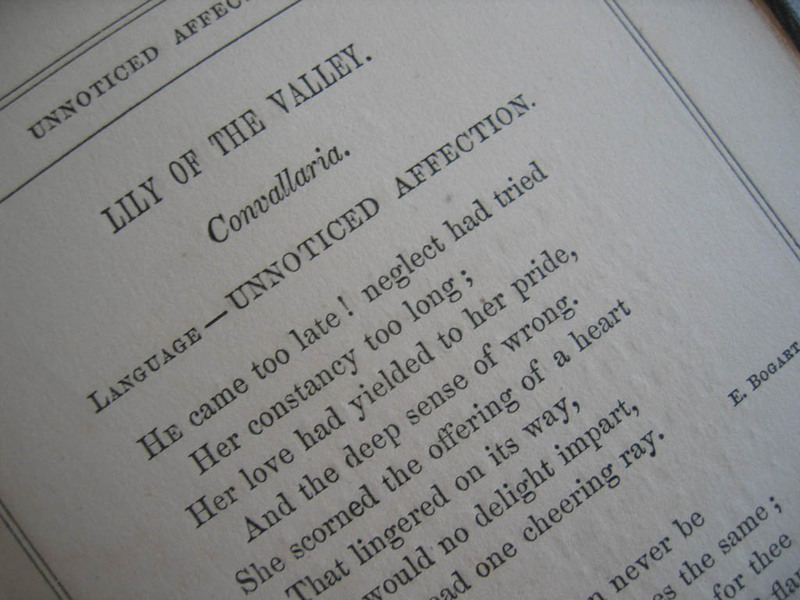 It was published by the Dayton and Wentworth Company. 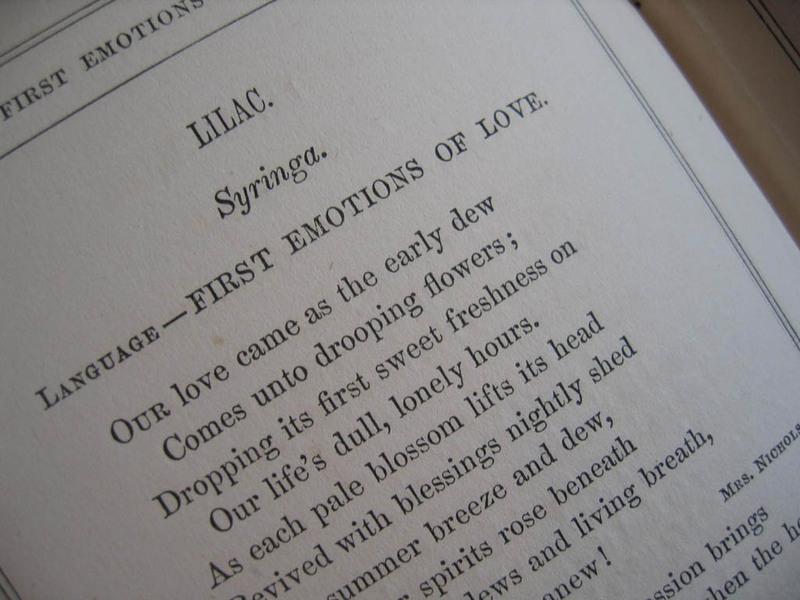 This is one of the earliest Language of Flower books, and is just a terrific piece of history on how the Victorians viewed flowers and their symbolism with regards to etiquette and manners jurisdiction. Each flower has its virtue listed below its name, as well as poetry. Some of the flowers within include: acacia rose sweet alyssum flowering almond aloe amaranth anemone arbor vitae aspen tree scarlet auricula bachelor's button balm balsomine basil bay wreath bay leaf bell flower bayberry bindweed box bramble buttercup catchfly camomile carnation cedar tree cherry blossom clematis cinquefoil cowslip coreopsis crocus crown imperial cypress daisy dandelion sweet briar everlasting evergreen fir flax flower of an hour flower de luce flowering reed forget me not foxglove geranium hawthorne hellebore heliotrope hibiscus honeysuckle hydrangea ice plant ivy jasmine japonica jonquil laburnum ladies' delight ladies' slipper larkspur laurel lavender lilac lily of the valley locust lotus love in a mist love lies bleeding mignonette mimosa mistletoe moss mulberry tree myrtle narcissus nasturtium nightshade oleander olive orange blossom oxeye everlasting pea sweet pea perrywinkle petunia phlox china pink red white poppy primrose evening burgundy rose bridle carolina multiflora versicolor musk moss rosebud yellow rosemary saffron snapdragon snowdrop snowball star of bethlehem sweet william syringa tansy thistle tulip venus's looking glass blue violet water lily wallflower. 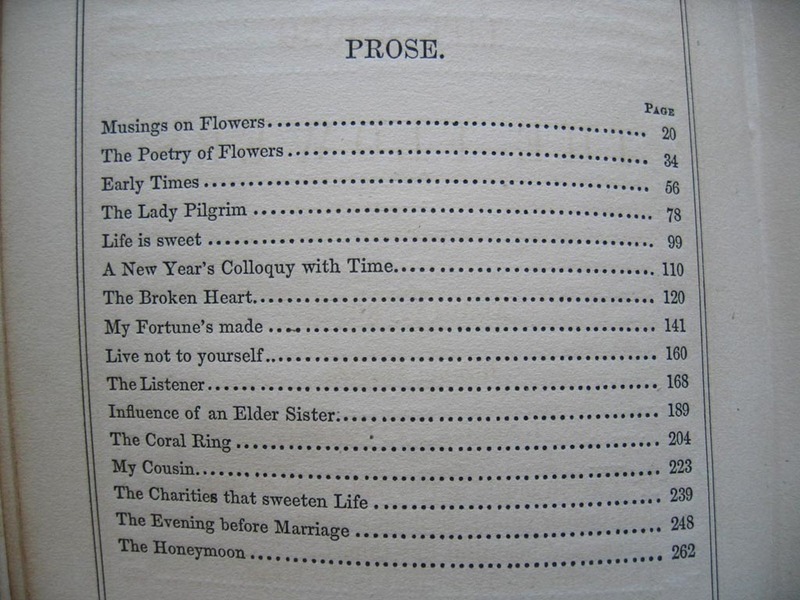 There are also sections on Prose that include: Musings on Flowers, The Poetry of Flowers, Early Times, The Lady Pilgrim, Life is Sweet, The Broken Heart, Live Not to Yourself, The Listener, Influence of an Elder Sister, The Coral Ring, My Cousin, and The Charities that Sweeten Life, The Evening Before Marriage, and The Honeymoon. It has a hardbound red cloth cover (SCARCE), gilt title on spine, 272 pages, an appendix, and measures aprox 5 x 7.25 inches. The gilt-embellished front cover has a gilt rose cartouche, flanked by an impressed outer edge with details of scrolls, leaves and flowers. The back has the same impressed design. 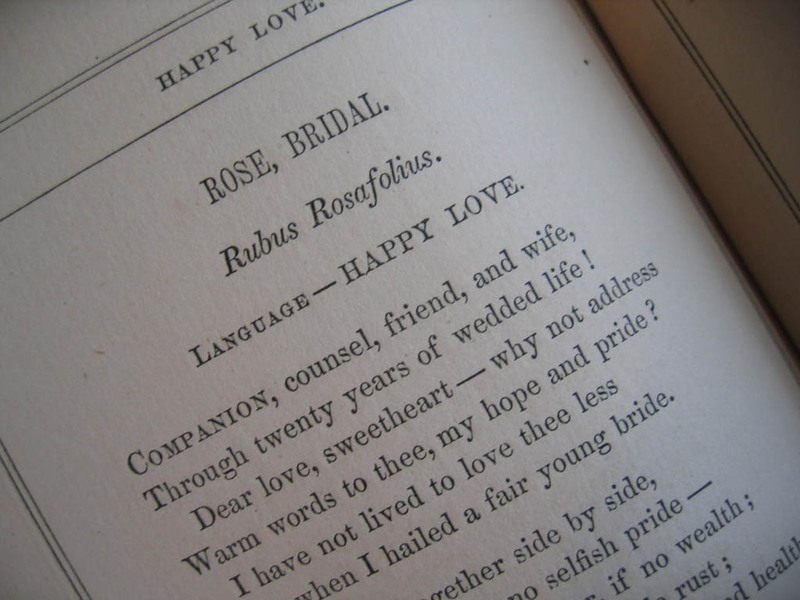 The title page has a lovely engraving of a lady holding a small bouquet. Amazingly, the inside front and back hinges are uncracked, and the text block is tight. The spine and cover boards have moderate wear at the edges and corners, minimal with a small pinhole area near the bottom of the front spine edge. The inside is quite good with very, very light foxing, the pages being very clean, with a lovely patina, the text on linen-like thicker page stock. The front flyleaf page has a small rose print adhered to it. A lovely gift for the gardener, or the lady's coffee table.